On Tuesday, Pennsylvania will hold a special election for PA-18, a House district that won’t even exist next year. Normally that’s not the kind of election that draws attention, yet on Saturday, President Trump visited to rally Republicans. And when all is said and done, about $12 million will be spent on advertising on the race. Why all the interest in a district that’s being eliminated as part of court order? Because Pennsylvania 18 is a battleground that shouldn’t be a battleground. It’s a district Donald Trump won by 20 points in 2016 and where the incumbent Republican last ran unopposed, yet polls show the race in single digits. Both the Cook Political Report and Real Clear Politics rate the race between Democrat Conor Lamb and Republican Rick Saccone as a toss-up. 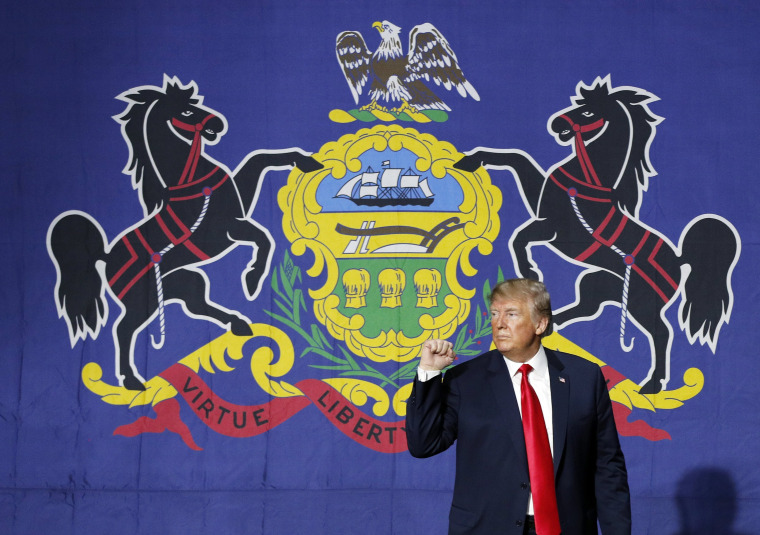 There are a few forces behind the sudden shift in Pennsylvania 18. Trump’s slumping approval numbers have more than a little to do with it, of course; Gallup data show his job approval sits at about 42% in the state. And in many ways Lamb, the Democratic challenger, is a perfect fit for this district – a Marine veteran and former prosecutor with an Ivy League education. But the bigger stories in the 18th may be about perception versus reality and the dangers of gerrymandering – the reason Pennsylvania’s congressional map is being thrown out in the first place. Pennsylvania’s 18th congressional district, sits squarely in what most people think of steel country. It’s the western side of the state, greater Pittsburgh, and it’s not very diverse, a plus for Republicans who do best with white, non-Hispanic voters. But a closer look at the numbers show the district is not the blue-collar haven it might first appear to be. The median household income and the percentage of population with at least a bachelor’s degree in Pennsylvania 18 are both above the national average – $63,825 and 36.5% respectively. Furthermore, the number of people employed in manufacturing is actually under the national average. So even if the district has a Republican lean, and election data suggest it does, those others numbers indicate that it is not an especially “Trumpy” brand of Republicanism. And some of the GOP’s socio-economic concerns in the district come from how it was put together by state Republicans in a pre-Trump era. The 18th is not a tidy geographic unit and runs through very different populations. The map’s silhouette shows two angular blobs connected by a small land bridge. The boundaries gather in rural Republican areas in the southwest corner of the state in Greene County, then cut around Democratic-leaning Pittsburgh to add in a lot of better-educated, suburban voters to the city’s south and east. Those educated suburbanites are crucial. In 2016, the largest share of congressional votes in this district came from suburban voters in Allegheny County, where more than 39 percent of the 25-and-older population has at least a bachelor’s degree. Far fewer came from rural Greene County, where only 17 percent have a 4-year degree. There was a time not very long ago when the mix of voters in the 18th – college-educated, white suburbanites and rural, blue-collar workers – worked well for the GOP. That coalition of voters propelled Donald Trump to the White House. But since Trump’s inauguration, the numbers suggest the story has changed. A long list of polls show President Trump and GOP are struggling with educated suburbanites in 2018. The January NBC News/Wall Street Journal poll found that only 29 percent of college educated white voters approved of the job that Trump was doing as president. None of that means the race Tuesday is certain to go to the Democrats, but the income and education figures in the 18th are a big part of why the polls show the race is close. And even if Republicans hold onto the seat Tuesday night, that should be a cause for concern among the GOP faithful. That’s because Pennsylvania 18 is not alone. There are other Republican-leaning districts that share a similar voter make-up – and they aren’t going to disappear next year.